PROTESTERS will be descending on Shirley Park this month, speaking out about the trees and hedgerows which would be removed as part of the Parkgate development. A recent survey found that while two thirds of shoppers were in favour of the ASDA superstore, 98 per cent were against plans to remove the greenery. Now a demonstration has been organised, with crowds gathering in front of the trees which are under threat. Shirley Residents’ Association, Solihull Ratepayers, SAMRA and Solihull Tree Wardens are due to take part. Solihull MP Lorely Burt, MEP Nikki Sinclaire and Shirley’s ward councillors will also be invited. The groups argue that cutting down the trees and replacing them with a set of apartment blocks will destroy the park’s rural character. Loss of parkland has always been one of the most controversial aspects of the scheme. Campaign group, Keep Shirley Alive, has said that losing three acres is unacceptable and argue that there’s already a lack of open space. 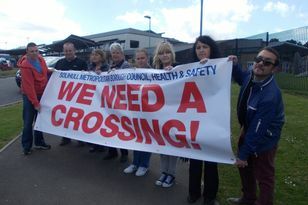 Developers Shirley Advance have said that the loss of the trees is “regrettable” but necessary to the scheme. The demonstration will be taking place on Saturday, August 21 - starting at 11am. OVER 300 people turned out at a protest last weekend - hitting out a plans to pull down trees and hedgerow in Shirley Park. LOCAL Lib Dem MP, Lorely Burt will be pounding the streets of Shirley this week asking residents their views on the latest Parkgate scheme proposed for the area.